If you need a dessert for pretty much anything, then look no further. 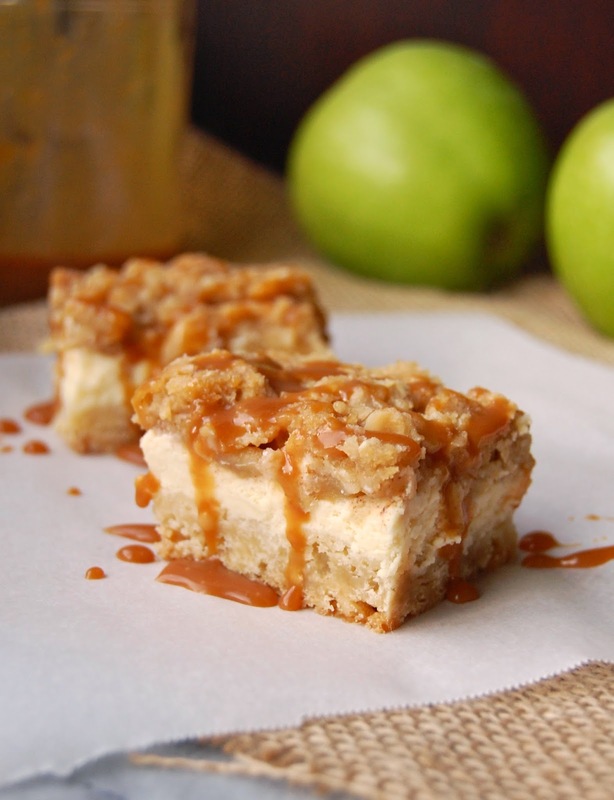 Apple streusel + cheesecake + homemade caramel = the best dessert. Ever. I'm not lying. My husband took these bars to the Thanksgiving potluck at his work. The entire plate was gone in no time, and lots of people asked for the recipe. Always a good sign! When he first asked me to make something for the potluck, I immediately went into stress mode. Don't get me wrong, I love to bake and get excited about the opportunity to bake (and know that it isn't going to sit in my kitchen and tempt me to eat all 5000 calories), but I hate narrowing down all the options. There are SO many awesome desserts out there. How do you choose?! I have to thank The Girl Who Ate Everything for discovering this recipe. It is the number one recipe on her site (which I love), so I knew it had to be good. Oh my goodness, this recipe did not disappoint. 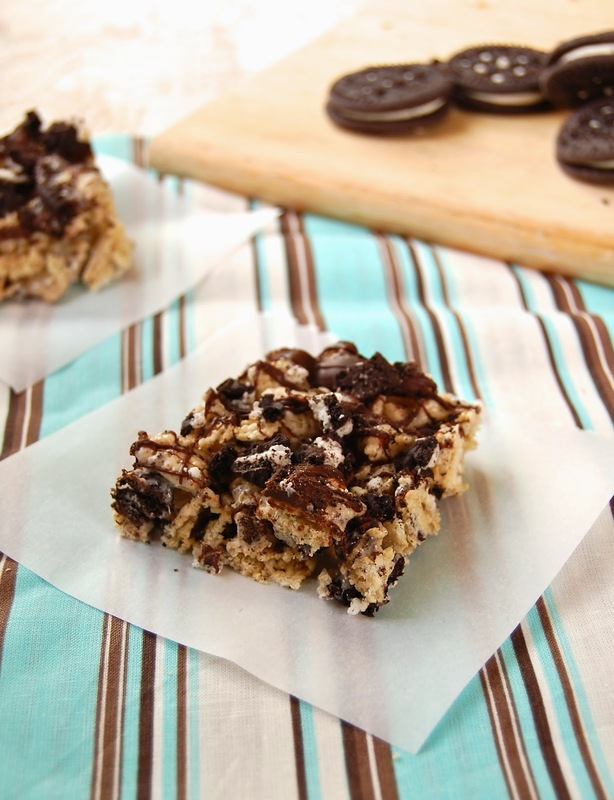 Seriously, stop your search for the perfect dessert and make these bars. Preheat the oven to 350°. Lightly spray a 9x13 baking pan with cooking spray and line with parchment paper, leaving a 1 inch overhang on the sides. To prepare the crust, in a medium bowl, mix the flour and brown sugar together. Cut in the butter using a pastry blender or 2 forks until crumbly. Press into the bottom of the baking pan. Bake 13-15 minutes, until lightly browned. To prepare the cheesecake layer, in a large bowl, add the cream cheese and sugar. Mix on medium speed using a hand blender until smooth. Mix in eggs, one at a time, and vanilla until smooth. Pour on top of the warm crust and smooth into an even layer. To prepare the apple layer, in a medium bowl, mix the apples, sugar, cinnamon, and nutmeg together. Spoon over the top of the cheesecake in an even layer. To prepare the streusel layer, in a medium bowl, mix the flour, brown sugar, and oats together. Cut in the butter using a pastry blender or 2 forks until crumbly. Sprinkle over the top of the apples. Bake for 40-45 minutes, or until set (the center should not jiggle). Let cool at room temperature for 1 hour, then cover and place in the refrigerator. Once chilled, use the parchment overhangs to lift the cheesecake from the pan and transfer to a cutting board. Cut into bars. To prepare the caramel topping, in a medium saucepan, briefly stir the sugar and water together. Bring to a boil over medium heat without stirring. Continue boiling until the caramel reaches a deep amber color. Immediately remove from heat. (Do not overcook or the caramel will taste bitter.) Slowly pour in the heavy cream, vanilla, and salt (if using) while gently stirring. (The caramel will bubble violently.) Let cool to room temperature. Drizzle the caramel over the bars before serving. Yaaay for soup season!! When I woke up this morning, it was a chilly 26 degrees. In a month, that will feel warm. When I first moved to Alaska, it was -20 for the entire month of December. Brrrrrr!! Fingers crossed that it doesn't get that cold, but I hope it stays cold enough to snow. We are all excited to sled, ski, and play hockey. Now the kids are going nuts wondering when they get to play in the snow, and my husband and I are in panic mode because we still need to get ready for winter...the kids need new snow clothes (seriously, when do they stop growing so fast?! ), new hockey skates, the garage needs to be cleaned out so we can fit both cars in (sorry but there's no way I'm scraping off a frozen car every morning with two toddlers in tow), and the yard needs a final clean-up. Sheesh! Even with all the work, I wouldn't change a thing. I love winter here. I love skiing all day or taking the kids skating on the pond, and then coming home to a hearty, comforting bowl of hot soup. 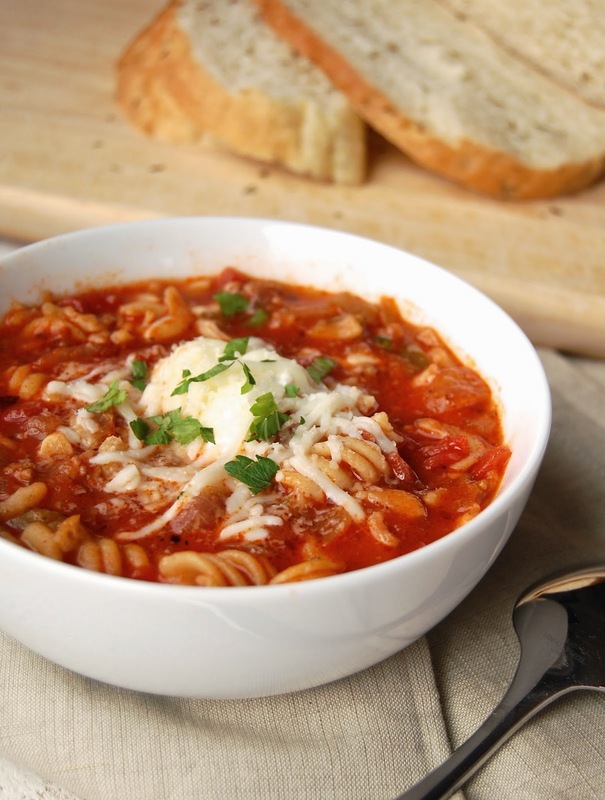 This was my first time trying lasagna soup, and let me tell you, I will be making it many, many times this winter. It had all the wonderful flavors of lasagna, but without all the work! In a large dutch oven or pot, cook the sausage, onion, bell pepper, salt, and pepper together over medium-high heat until the sausage is cooked through and the onions have softened. Drain off excess fat, if necessary. Add the garlic and Italian seasoning; cook for 30 seconds longer. Stir in the diced tomatoes with their juice, tomato sauce, brown sugar, and chicken broth. Bring to a boil, then reduce the heat and simmer for 30 minutes. Add the pasta and cook until softened, about 15 minutes longer. Season with salt and pepper to taste. Serve with a dollop of ricotta cheese, shredded mozzarella, grated parmesan, and fresh herbs on top. Happy Halloween!! I am SO happy that it is finally here! My kids have been asking to go trick-or-treating pretty much every day since September when they do this crazy/awesome thing called Trick-or-Treat in the Heat here. You should have seen them this morning...they woke up super early, came in and jumped on me (waking me out of a deeeeep slumber - yay for me), and begged to put their costumes on. I don't usually wake up bright-eyed and bushy-tailed (just ask my husband), but they were so super cute and excited, that I got up with them and joined the Halloween party parade. 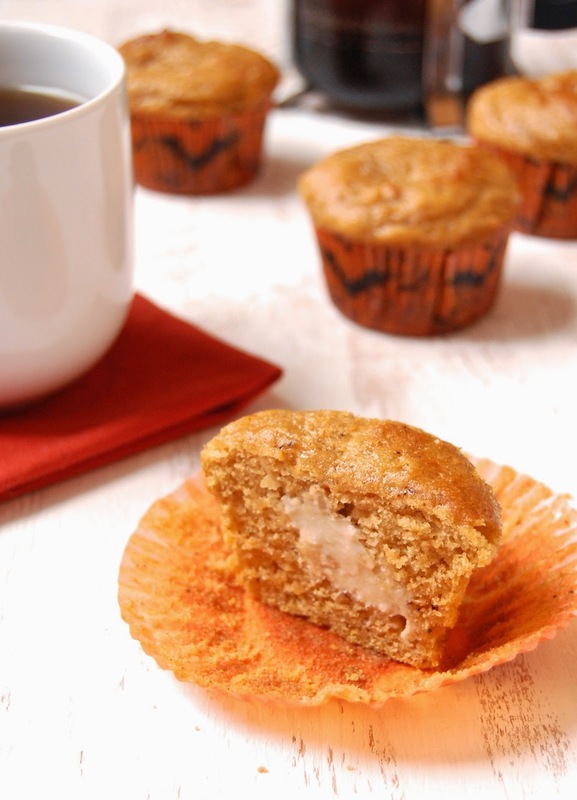 I wish I could say that our day started off with my favorite muffins of all time, these unbelievably delicious and moist pumpkin spice muffins with maple cream cheese filling, but no, my family devoured these waaay before Halloween. I'm going to make another batch later today and hide them in the freezer, but shhh...that can be our little secret. No, our morning started off with Cheerios and Rice Chex with Halloween sprinkles on top. Seriously, if you want your kids to think you are the coolest mom EVER, let them put sprinkles on their cereal. I still can't get these muffins out of my mind so I am off to the kitchen to bake, while I keep the kids busy painting and drawing on our pumpkin. There will be no carving this year because someone left the pumpkin outside and now it is frozen solid. Oh well, the kids are still excited and my husband is pumped because he doesn't have to clean out the guts. I might have to leave the pumpkin outside every year...heehee! To prepare the filling, mix the cream cheese, powdered sugar, and maple extract together until smooth. Transfer to a ziploc bag. Line a baking sheet with wax paper. Snip the bottom corner off the ziploc bag. Pipe 20 dollops (~tbsp size) of the cream cheese mixture onto the baking sheet. Place in the freezer for at least 2 hours. To prepare the muffins, preheat the oven to 350°. Line muffin pans with cupcake liners. In the bowl a mixture fitted with a paddle attachment, mix the pumpkin, eggs, yogurt, oil, applesauce, water, sugar, and vanilla together on medium speed until smooth. In a separate bowl, whisk the flour, baking soda, salt, cinnamon, nutmeg, cloves, and ginger together. With the mixer on low, slowly add the dry ingredients into the wet ingredients. Mix until well blended, scraping down the sides of the bowl with a spatula as needed. Place a small amount of batter in the bottom of each well (just enough to cover the bottom). Place the frozen dollop of cream cheese in the middle. Add remaining batter on top so that each well is ~2/3 full. Bake for 22-26 minutes or until the tops are cooked and feel firm to the touch. Let cool in the pan for 5 minutes before transferring to a wire rack to cool completely. Refrigerate until ready to serve. My life is craaaaazzzzy. I keep waiting for things to slow down, but I don't think that is going to happen anytime soon. Our summer was busy with traveling and visitors, and then September hit and BAM! we got a puppy. I seriously think a puppy is more work than a newborn baby. You have to wake up every two hours with them, and the BIG difference...they move!! At least a newborn stays in one place. No, this puppy runs all over the house chasing the kids, jumping on everything, and trying to chew every single thing in sight, including our brand new couch, coffee tables, pillows, and random kid toys laying around. I'm exhausted! 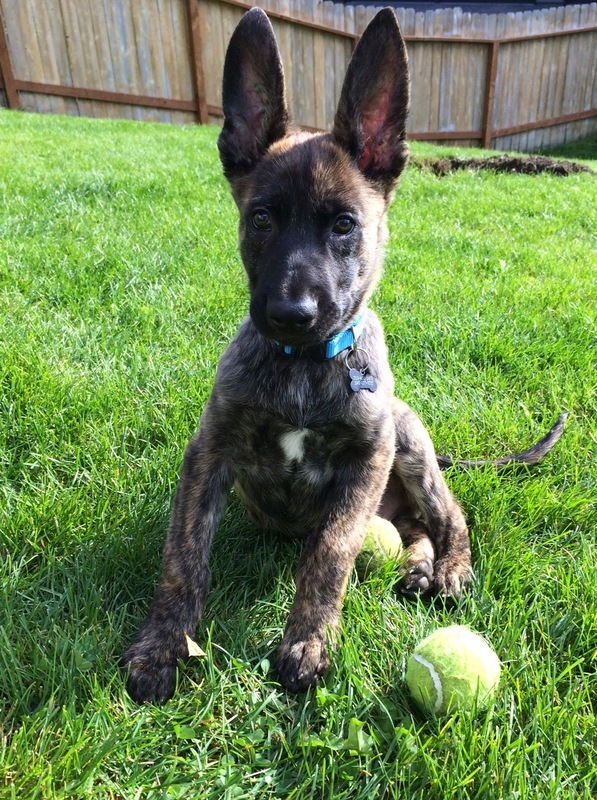 He's lucky he's so freaking cute! Line a 9x13 baking dish with parchment paper or aluminum foil, leaving a 1 inch overhang so the bars can easily be removed from the pan. Alternatively, line a baking sheet if you like thinner bars. Roughly chop 16 Oreos for the bars, and 4 Oreos for the topping. In a large pot, melt the butter over medium-low heat. Add the marshmallows and cook until melted, stirring frequently. Stir in the Vanilla Chex and (16) chopped Oreos until well blended. Remove from heat. Immediately transfer the mixture to the prepared baking dish or sheet and spread into an even layer. (I like thinner bars so I used a baking sheet and pressed the mixture gently with wet fingers until the desired thickness was reached.) Let cool completely. In a small bowl, heat the chocolate chips in the microwave in 30 second intervals, stirring after each interval, until melted. 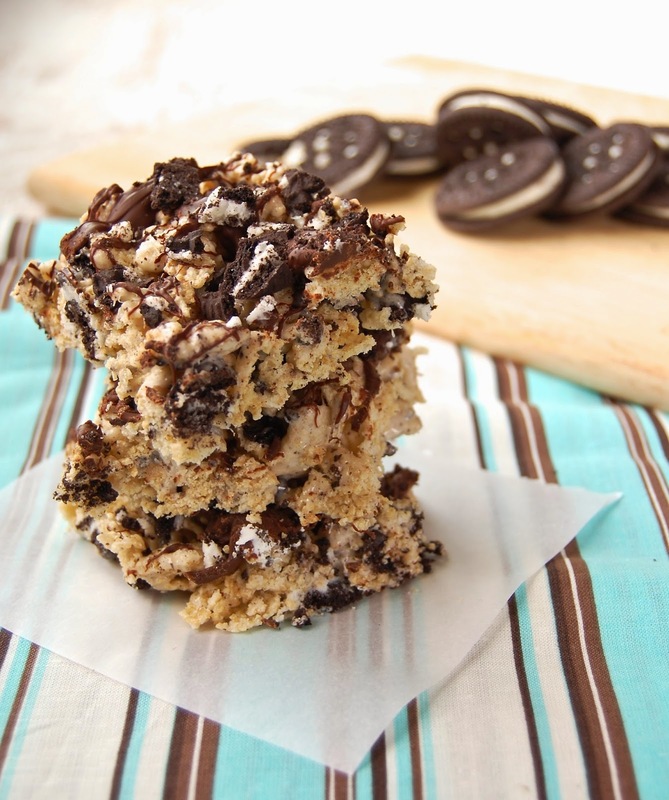 Drizzle the chocolate over the top using a fork or spoon. Immediately top with the remaining (4) chopped Oreos. Using the parchment overhang, gently lift the bars from the pan and transfer to a cutting board. Slice into bars. Bring on the BBQ! Yes, it is September, but no, it is not too late for grilling. Some places like, ahem...Alaska, are getting a little wet and chilly, but even that won't keep us from the grill. Even if it means throwing on a rain jacket and a pair of XtraTuff boots, these pork chops are worth making. My dad has been here for the last month visiting (and fishing, of course! ), and made these pork chops for us. He declared them to be some of the best pork chops ever, but....we were skeptical. I should have known better than to doubt my dad. They were seriously some of the best we have ever had. They had a little kick from the chipotle, a little sweetness from the honey, and a little tang from the orange zest. They were wonderfully balanced and easy to make. And healthy! We will definitely be making these over and over again...even if it means shoveling a path in the snow just so we can get to our grill! In a small bowl, mix the olive oil, chipotle chili powder, salt, orange zest, and garlic together. Rub evenly over both sides of the pork chops. Let marinate for 15-30 minutes. Preheat a charcoal or gas grill over medium-high heat. 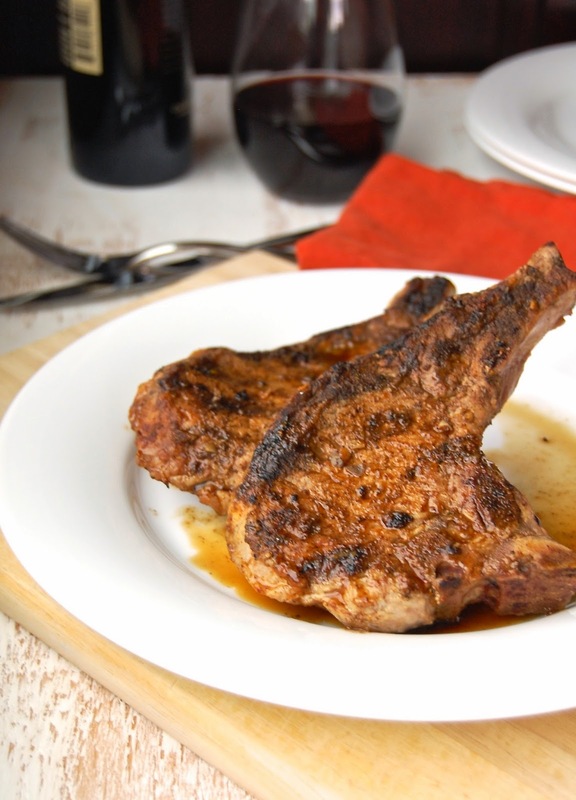 Place the pork chops on the grill and cook for 4-5 minutes per side, flipping once, or until the internal temperature registers 145. Baste both sides with honey during the last couple of minutes of cooking. Set aside to rest for 3-5 minutes before serving.